Well it is newsletter time once again for THHN and we have a huge amount of news to tell you about! This has been a record breaking summer for the charity – thanks to our amazing supporters we had our busiest week on record in August, seeing 7 families who have seriously ill or bereaved children or families with a terminally ill parent – totalling 33 people benefiting from our services – and we awarded over £1,700 in grants to cover car hire, fuel costs and train tickets for these families to reach their holiday destinations. This is all thanks to our incredible supporting businesses and fundraisers! This summer has seen a record number of fundraising events being organised for the charity as well as some very special individual fundraising efforts. We had a bumper weekend in June with two incredible events put on by longtime THHN supporter Dave Hanbury of the multiple award winning Hanbury’s Licensed Fish Restaurant and Takeaway. The first event was the Rat Pack Vegas Spectacular that was attended by over 300 guests. The evening event was an outstanding success with a wonderful sit down meal – live entertainment from the incredibly talented international vocalist Tara Mathew and the world renowned Rat Pack Vegas Spectacular Show as well as the most incredible charity auction which included some stunning lots – such as return tickets to New York and a signed Manchester United football. Not forgetting the amazing Babbacombe Garage Prize Draw – which saw the 1st prize winner walking away with £1,000 cash! The second event followed the next day on Sunday with the “Hanbury’s Fish & Chips On The Downs Music Festival” – this fantastic charity event is in its 6th year of running now and THHN was lucky enough to be this year’s benefitting charity. The event see’s people buying fish & chips from Hanbury’s takeaway to gain free entry in to the festival – or you can pay on the gate, Dave Hanbury donates all of the profits from the takeaway to the chosen charity of the year. There is also a charity auction and raffle at the event which is always very well supported – and this year’s event was certainly no exception! There was literally thousands of people who passed through the marquee throughout the day, enjoying live performances from some of the South West’s finest acts including; THHN Ambassador Gary Nock, the Krankee’s, 3 Bags Full, Funkty Dumpty and Sounds of the Sirens to name but a few. A special thank you to THHN Volunteer Vix Lamble-Blake for manning the THHN stand for the day and thanks to THHN legend – Hannah Jones for walking around with her Olympic torch, collecting donations in return for a photo with the torch! In total both events combined raised over £17,000 – including sponsorship from HSBC and Babbacombe Garage. I really cannot thank Dave Hanbury enough for this breathtaking support of the charity, I would also like to pass my special thanks on to the following, who without their support and very hard work none of this would have been possible; Martyn Strange of the Babbacombe Inn, Nicky Allen of All The Right Notes, Rotary Clubs of Torquay & Babbacombe and St Marychurch, HSBC Community Team, Simon and Len from Babbacombe Garage, the staff from the St Marychurch branch of HSBC, Linda and Rachel Dewis, Judith Payne, THHN photographer Dougie Worthington, all of the businesses who donated prizes to the events and of course everyone who attended and everyone involved in the events! Torquay fire stations blue watch have been very busy raising funds for THHN by making collections in and around Torquay and by completing a sponsored walk of the Cotswolds in June. We have yet to hear the final amount raised, but a huge thank you to all of the guys and girls of blue watch! THHN’s “Holiday Liaison Officers” John & Angela Bunce of Vomero Holiday Apartments in Torquay have been keeping very busy raising funds for the charity, they have gone to great effort and organised two tombola stands. The first was held at Herbs & Honey’s wellbeing fair on Babbacombe Downs and the second was held at the Rotary Club of Babbacombe & St Marychurch’s Agatha Christie Fete in Princess Gardens in Torquay – both stands were incredibly successful, with super prizes! A special thank you to John & Angie’s friend Margaret Magovern who put such effort in to the second stand by donating lots of beautiful teddy bears that she had hand knitted hats and cardigans for, she also helped to man the stand for the day. John & Angie have also been collecting for the charity at Vomero and in total they have nearly raised £500 – so a very big thank you to you both. Newton Abbot Racecourse very kindly made THHN the charity for Ladies Day back in June, where they organised a raffle for us – we sold the tickets and took £1,505 in just under an hour! A very big thank you the racecourse and to Carrie Darby for all of her hard work in putting the raffle together and for inviting us to attend, special thanks too goes to my team of volunteers who came along to sell the tickets. Britannia Royal Naval College Senior Rates Mess made THHN their charity for the year and invited me to attend a cheque presentation along with lunch and a tour of the college in Dartmouth. I was presented with a cheque for £300 by the Commodore – commanding officer. A very big thank you to all the crew at the college, especially to Chief Petty Officer Bill Amery for getting in touch and nominating THHN and for giving me a tour of the amazing building and grounds. All Saints Church in Babbacombe have been fundraising for us and involving the pupils of Babbacombe C of E School and they raised a total of £170.71p. So a very big thank you to all of the children for their efforts and special thanks to Father Paul for nominating us. We have received the funds from the charity gala organised by Thirstywork of Exeter last March – they raised a total of £730. Thank you to the Imperial Hotel Torquay who very kindly made a donation from their bar takings and a very special thank you to Sarah Moody for all her hard work in organising this event and of course to all who attended. A big thank you to Claire Slough of Westward Housing – who organised a “Dress Down Friday” in aid of THHN and they raised a total of £50. A special thank you and congratulations to Dr. Sarah Taylor of Smart Practice Sports Massage & Remedial Therapy and her husband who got married in June, instead of buying wedding favours for their wedding guests they donated £50 to the charity. The Inner Wheel of Torquay raised and donated £250 to THHN and they invited fellow THHN director and trustee Martin Brook along to one of their meetings to talk about the charity – where they presented him with a cheque. A very big thank you to all the ladies of the club for your very much appreciated donation. Pride Torbay made THHN their charity of the year for 2012 and they have been holding various events in the bay this summer, a young lady called Danielle Moore (a pupil of Brixham C of E Primary School) attended one of their events – “The Rainbow Proms” where she sold her stunning handmade jewellery. Danielle also attended a car boot sale the following day and she raised £65.60p for THHN, so a very big thank you to Danielle for all your fantastic efforts! Special thanks too goes to her Mum Sarah for helping her out. Mandy Falconer of Fanciflair also held a raffle at the Proms event and raised £25 for the charity – so a very special thank you to Mandy too. A big thank you to our runners who took part in the annual Torbay Half Marathon back in June, Dean Lawler raised £100 and husband and wife team Laura & Allen Flounders raised a total of £246, your efforts are very much appreciated! A special thank you too goes to THHN director Martin Brook who completed the run in his THHN vest! If any of you are interested in running for THHN please do get in touch – we can provide you with a free running vest or t-shirt, sponsorship forms and help set up a Just Giving page – please email fundraising@thhn.co.uk or call 01803 325152 for more information. If you are interested in holding a fundraising event we would love to hear from you – and we can offer you expert guidance and help to ensure your event goes off with a bang! We can provide you with banners, flyers, balloons, charity bands and much more. Please email fundraising@thhn.co.uk or call 01803 325152 for more information. We are also looking for any businesses/organisations who would potentially like to make THHN their charity for the year, if anyone would like to nominate us or would like more information then please do get in touch. A very big thank you to all of our volunteers who have been chauffeuring THHN families who have no transport around this summer and special thanks to Elaine Harrison who has been allowing her limousines and chauffeurs to spoil a few of them! Faith’s Beach Hut has finally been put in to storage for the winter months after its busiest summer ever! THHN families have had some very special days out at the seaside – enjoying the hut and all it has to offer. A very big thank you to Caroline and Paul Hooper who manage the hut for us, they have given it a complete makeover this year and it looks stunning. A very special thanks too goes to Hannah Jones who donated £250 earlier this year so the Hooper’s could buy new gear to kit it out with. THHN has been very been the beneficiary of some incredible gift donations from a very kind lady whom I have been calling our “Fairy Godmother”! So far she has donated 3 weekend breaks in Blackpool to see the illuminations, a barge holiday, a holiday to winter wonderland holiday for 6 people in Center Parcs, family tickets to the circus and Pizza Express meal vouchers to name some of the wonderful donations she has made. She has made some people very happy indeed and I am eternally grateful to her! We have some new business supporters who have joined in with our scheme – please give a very warm welcome to the Witherspoons pub – Talk of the Town in Paignton, Brunel Manor in Torquay, The Royal Exeter Hotel in Bournemouth and Parkfield Activity Centre in Paignton. I would like to offer my sincere thanks for getting in touch with your incredible offers of support – I am sure you will find your journey with the charity a very rewarding one indeed. I would like to offer my sincere thanks to all of team THHN who have been a huge help in moving the charity forwards. In particular I would like to welcome our new secretary Gwen Margetts who has come on board in the role of secretary. We also now have a fundraising manger called Brian Lewis – Brian has a vast amount of experience in charity fundraising and will be a huge credit to the charity. Both Gwen and Brian will be taking a big weight from my shoulders and I really cannot thank them enough and I am looking forward to working closely with them both over the coming months. A special thank you to our “Holiday Liaison Officers” John & Angie Bunce who have been working very hard in helping me find holidays for our THHN families – again another big weight from my shoulders. Thanks too goes to THHN webmaster – Simon Dingley, who has been updating our website with Facebook and Twitter feeds as well as putting in place our advisory cookies pop up. THHN’s Creative Media & IT Manager – Matej Bendzala has been working around the clock on designs for flyers, forms, business cards, collection tins and running vests to name just a handful of jobs – not to mention all of the technical support he gives on a daily basis! Matej really is an un-sung hero of THHN, so a very big thank you indeed goes out to him for all of his countless hours of hard work. A big thank you too goes to volunteer Bob Vaughan who has made dozens of deliveries of welcome packs and collections for THHN – as well as offering lifts to THHN families who have no transport, his support has been invaluable. I would like to say a great big thank you to each and every person who helps out with the day to day running of THHN – you all make a difference and in the words of director and trustee Martin Brook “We are all cogs in the wheel”. Marine Hotel – Paignton has helped 4 families referred from the following organisations; Bath CLIC Sargent Team; Bristol CLIC Sargent Team; Macmillan Nurse and St Luke’s Hospice Sheffield. Brampton Court Hotel – Torquay has helped 2 families referred from Joss Parkes Searchlight and Cornwall CLIC Sargent Team. Hotel De La Mer – Babbacombe has helped 15 families referred from Rainbows Children’s Hospice; Bath CLIC Sargent Team; International Costello Support Group; Derian House Children’s Hospice; a GP from Cumbria; PASIC; Bath Children’s Service; CHECT; Barnardo’s; Lifetime Services Children’s Community Nursing Team; Royal Marsden Hospital CLIC Sargent Team; Bristol CLIC Sargent Team and Rainbow Trust Children’s Charity. Rutland Hotel – Torquay has helped 1 family referred from Birmingham CLIC Sargent Team. 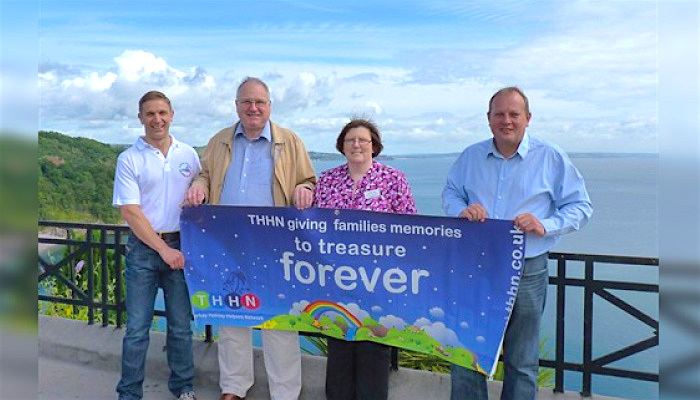 Cliffs At Babbacombe – Torquay has helped 1 family referred from Rainbow Trust Children’s Charity. Ashley Court Hotel – Torquay has helped 4 families referred from Shooting Star Chase; Royal Marsden Hospital CLIC Sargent Team; Joss Parkes Searchlight; Taunton CLIC Sargent Team and Cambridge CLIC Sargent Team. The Abbey Inn – Buckfastleigh has helped 5 families referred from Exeter CLIC Sargent Team; Bath CLIC Sargent Team; Rainbows Children’s Hospice; Joss Parkes Serachlight and Birmingham CLIC Sargent Team. Brunnel Manor – Torquay has helped 2 families referred from a GP in Dunstable and Victim Support. Yarak – Collumpton has helped 1 family referred from Friends of OSCAR. Westbrook – Torquay has helped 1 family referred from Birmingham CLIC Sargent Team. We have also sent a family to Blackpool on an illuminations break – kindly donated by our fairy godmother. We have also supported 2 local families by giving them action packed holidays from home – which included going to see JLS in concert! An enormous thank you to all of our supporting businesses who have offered free holidays and supported our families – you are all quite simply amazing! If any of you know of any businesses who would like to support our network we would love to know, please get in touch by email enquiries@thhn.co.uk or call 01803 325152. Back in August THHN had its 3rd birthday and in that time we have given away 255 free holidays, the spread of the network has far exceeded my wildest dreams and none of it would have been possible without your support – so a huge and heartfelt thank you to you all, whether you volunteer, fundraise or your business supports our families – what we are achieving is not possible without your help. Together we continue to grow and help more families every month.